FBI agent Sean Archer knows how to stop elusive terrorist Castor Troy. He'll become him. Archer undergoes a futuristic surgery and has Troy's face mapped onto his, then infiltrates the terrorist's world to discover his deadly secrets. Travolta + Cage + Woo = maximum overdrive. The collaboration between these gonzo talents was an exercise in inspired insanity, and Travolta and Cage are pushing each other to absurd extremes, like they're in direct competition for who can be the craziest. The sentimental touches don't work as well as they do in Woo's best HK films, where action and melodrama are melded more seamlessly, but there are some great set pieces and a go-for-broke intensity that is unmatched in 90's US action films. Finally, a movie that knows exactly what it is. It works because it doesn't try to be anything it's not and plays to its strengths at every turn. 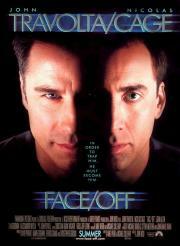 The only problem I have is how much better Cage is than Travolta at playing both parts.